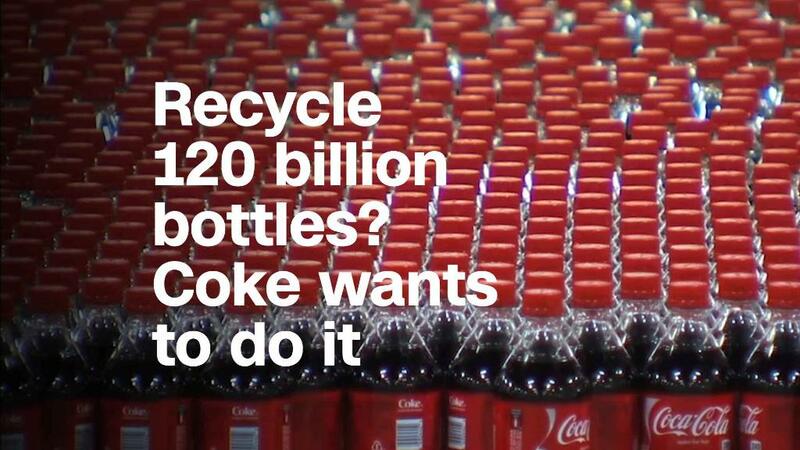 Coke (KO) is dubbing it the "World Without Waste" initiative. The company "is investing its marketing dollars and skills behind this 100% collection goal to help people understand what, how and where to recycle," according to a press release. "We will support collection of packaging across the industry, including bottles and cans from other companies." Coke says it will also make bottles with an average of 50% recycled content by 2030, and that it ultimately aims to use only recyclable materials. Coke says it's working to develop packaging that uses "plant-based" ingredients, or that use less plastic. "Bottles and cans shouldn't harm our planet, and a litter-free world is possible," Coke CEO James Quincey said in a statement. "Consumers around the world care about our planet, and they want and expect companies to take action." Environmental advocacy group Greenpeace said it is not impressed by Coke's plan. "Instead of focusing on reducing the amount of plastic it produces, the sure fire way to reduce ocean plastic pollution, Coca Cola is trying to offset its huge plastic footprint by investing in a bit more recycling," said Louise Edge, senior oceans campaigner for Greenpeace in the UK, in a statement. Greenpeace called Coke's plan a "Band-Aid" that won't meaningfully change the amount of plastic entering waterways. Greenpeace's statement also contrasted Coke's plan with UK retailer Iceland's decision to eliminate plastic packaging within 5 years. In an interview Friday with CNN's Poppy Harlow, Quincey said Greenpeace has the wrong idea. "I'm not sure they completely grasp everything we're saying today," he said. Quincey said that if the initiative is successful, there "will be no single-use bottles." The packaging will instead be chopped up or melted down and given a second life, either as a bottle or for other uses. The group said solid waste had "emerged as a major concern as post-consumer waste is estimated to account for almost 5%" of greenhouse gas emissions, which contribute to climate change. The World Bank urged countries to take action, recommending recycling as one of several ways the problem can be mitigated.